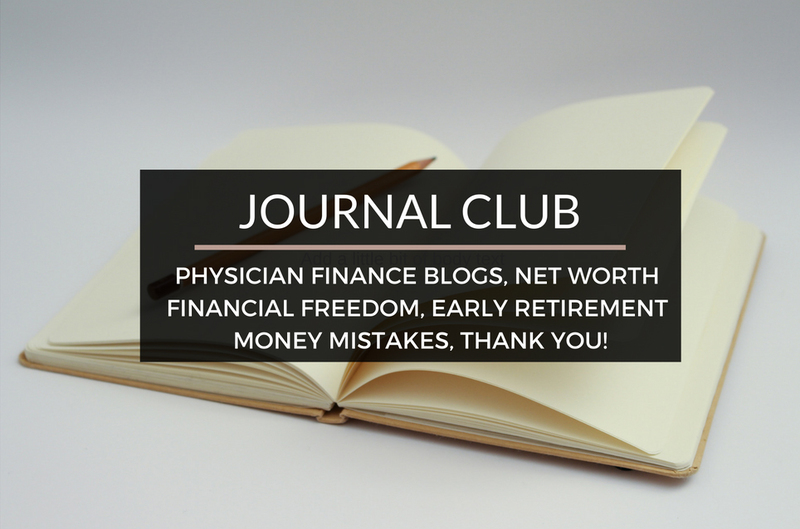 Journal Club 11-19-16 | Passive Income M.D. Topics: Physician Finance, Net Worth, Financial Freedom, Early Retirement, Money Mistake,Thank You! Also hear why it’s nice to live in Kentucky in the Sponsor Highlight. Proud to say I’m one of the “Other Guys” mentioned in this post by the White Coat Investor. Here’s his version of his physician finance blogroll – The Other Guys – A Review of Physician Financial Blogs. This cardiologist considers himself a dad first, then a doctor & blogs about it all on his site Dads Dollars and Debts. Check out this impressive article about how he ramped up his net worth quickly. Debt destruction – How We Improved Our Net Worth By Nearly $100,000 in 18 Months. If you missed this one by Physician on Fire a couple of weeks ago, you need to check it out. I’m shooting for Financial Freedom and it’s nice to hear his take on the definition in Financial Independence Versus Financial Freedom. There are a lot of early retirement blogs out there and if you’re wondering who’s the real deal, Mr. Tako Escapes walks the walk and talks the talk. Read about his experience after having retired last year. Was it what he hoped it would be? Find out in Early Retirement: One Year Later (An Honest Assessment). I’ve heard that as doctors, as long as we don’t make huge mistakes with our money we should be fine. Although I don’t think that’s completely true, I do know that big money mistakes can set you back pretty badly. That’s why it’s always great to learn from the experience of others. The Green Swan addresses this in his post Money Mistakes By Decade. I’ve noticed a lot of new visitors to the site in the last couple of days, no doubt as a result of the shout-out from the White Coat Investor. Thanks for stopping by and I hope you stay a while. I’m always trying to add fresh, new, actionable content, however I’m open to ideas, suggestions, overall feedback, etc. Send them through this page. Thank you for taking the time to check the site out! Thank you to everyone who has sent me a comment, note, question, etc. I love it all. Thank you to everyone who has been walking with me so far on this journey including PoF, FPMD, DWM, WCI, DOTB, DD, LoMS, ID, and many others I might’ve missed (sorry!). 1) What are the top 3 things you love about where you live? Wow, that caused me to stop and think! a. The people here are the friendliest and most helpful on earth. b. Fresh vegetables in the summer and cold, snowy winters (if we’re lucky). 2) Can you help physicians all across the country? Yes, we serve physician clients from coast to coast. About 90% of our doctor clients (we serve dentists, too) are “non-local” and we meet via FaceTime, Google Hangouts, and AnyMeeting. 3) Why did you decide to focus on physicians? To tell the truth, it’s because my strong personality is pretty compatible with doctors, plus I have the right skill set (35 years as a CPA, 10 years as a CFP, fee-only). It’s a good combination. However, it wasn’t until WCI started his forum in January 2016 that I really had the opportunity to interact and connect with doctors (which I prefer to buying ads, if possible). We have had to scramble to keep up with the new business, for which my team deserves all the credit. Johanna Fox Turner, CPA, CFP ® , RLP ® is the founder of Fox &amp; Co. CPAs, Inc. and Fox & Co. Wealth Management, a fee-only financial planning and investment management firm for doctors. She has 35 years of experience advising HNW clients on wealth protection, comprehensive financial planning, multi-state tax services, estate planning, business consulting, and succession planning. Both firms provide virtual Fixed Fee and hourly advice to clients throughout the USA and Mexico. If you’re too busy to juggle multiple advisors and want to clarify your finances, schedule a free consultation here. Previous articleDo You Still Need Disability Insurance With Substantial Passive Income?